Microsoft, who in their infinite wisdom and mercy giveth and taketh away has both given and taken away a powerful, free tool for helping to overcome a host of Windows 95/98/NT/2000/ME annoyances--TweakUI. 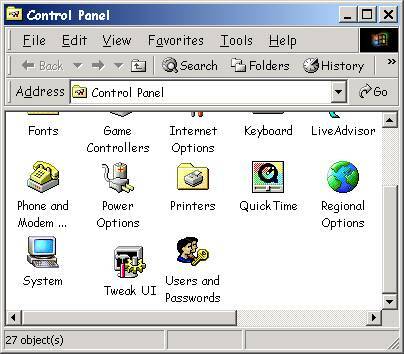 TweakUI is a Control Panel add-on, that has been developed by Microsoft programmers, and distributed in various ways by Microsoft, while at the same time, never quite being an official part of Windows, or officially supported by MS. 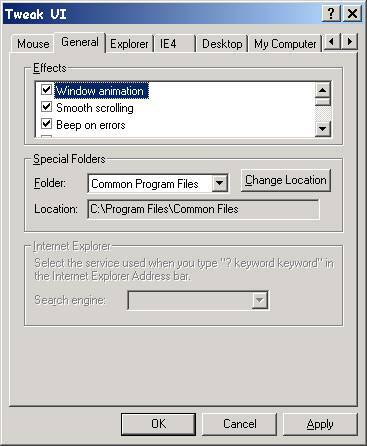 There are several different versions--one for Windows 95/NT 4.0 and one for Windows 95/98/NT if Internet Explorer 4.0 or later is installed--the difference being the changes resulting from IE4’s Active Desktop, a so-called TweakUI 2000 (aka version 1.33) and a version for Windows XP. The XP version is totally different, and isn't included in this discussion. The original, Win95 version can be downloaded from Microsoft at: http://www.microsoft.com/windows95/downloads/contents/WUToys/W95PwrToysSet/Default.asp. You’ll find TweakUI-95 along with a number of other possibly useful little utilities. Despite its name TweakUI-95 works fine with Windows 98, 98SE, ME, NT 4, etc. As you can see, the tweakui.inf file looks like a Notepad document with a little gear on it... important if you have file extension-viewing turned off (the Windows default)-- in that case, you see four different icons all with the name 'Tweakui'. Right-click on the inf's icon, and select INSTALL from the popup menu. You may be asked for the location once or twice--browse to the correct folder. During the installation, you’ll get a help file on screen--read it, then shut it down. When done, you won’t find an icon for TweakUI in the Start Menu--it installs as a Control Panel icon. (The WinXP version installs into the Start Menu and not the Control Panel-- just one of the ways it's different). 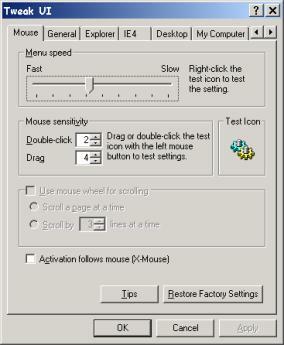 Start it up by double-clicking-- you’ll see a dialogue box with multiple tabs--the Win95 and 1.33 versions arrange them in several rows, while the Win98 version has a more awkward arrangement, showing a single row with arrows at the right hand end to move forward or back, to view additional tabs. 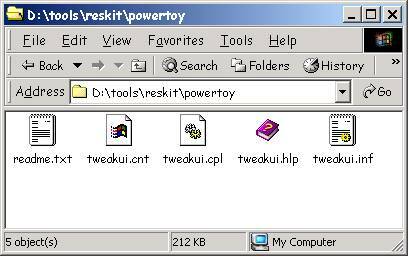 Here are pictures of TweakUI 1.33 installed on Windows 98SE and Windows 2000 systems- note that there are some differences in the contents of the various tabs. You can speed up how fast menus drop down (or open sideways, as in the Start Menu), and test the various speeds by right-clicking on the Gear picture. You can adjust mouse sensitivity for double-clicking and dragging (and again, test your changes). 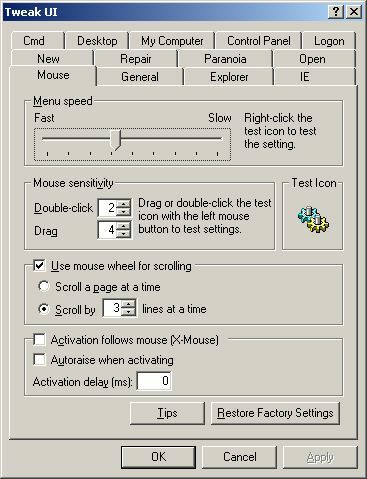 If you have a wheel mouse, you can set how much is scrolled at a time. The X-Mouse setting is more typical of Unix systems--an items is selected by simply resting your mouse over it, rather than by clicking it. Note that you can experiment freely, since you can restore the factory settings with a click of a button. The W98 version has lots of settings in the Effects section, while the Win95 version just has the top 3--though I tend to leave them all alone. Similarly, I pretty much ignore the options to reset Special Folders--the default location for Program Files, and more. If you’ve mysteriously got the Windows version and build number appearing the lower right-hand corner of the screen, you can turn it off here--it’s the last item, hidden in the Effects list. More useful--this one, for example, in the Settings section, lets you turn off the annoying ‘Prefix ‘Shortcut to’ on new shortcuts’. Hallelujah! You may be tempted to use the top section to turn off the arrow on shortcuts--resist tempation. It’s actually important to be able to easily tell the difference between an icon that’s a shortcut, and one that’s an actual program or document file. Deleting a shortcut is no big deal--the actual file remains. Deleting the real file by mistake, however, could have serious consequences. Leave the shortcut arrow alone! This is called the IE tab in version 1.33. You can use it to easily enable or disable Active Desktop. Turn off adding documents to the Start Menu’s Documents list. Clear the various history lists (Document, Run, etc) automatically on exit. You can also turn off showing Documents or Favorites at all in the Start Menu. (I leave Documents, but turn off the Favorites list). In version 1.33 you also get an item allowing you to turn off undefined 'Shell Enhancements'-- this removes the Win98-style interface additions-- primarily the Toolbars (little-icons beside the Start button), making your interface more like the original Windows 95 one. 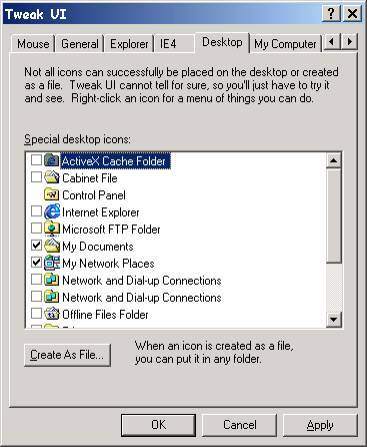 Finally--a way to turn off some of those sticky desktop icons, that won’t easily remove, even though you never use them--for instance, the Microsoft Exchange InBox in Win95-- or the Internet Explorer icon. Or, if you don’t want it visible, the Recycle Bin. If, before unchecking an icon, you Create it as File, you can store it in a different folder, but you can always get the icons back, if needed, simply by rechecking it, here. Note that you can’t turn off display of My Computer. And no, I don’t know why some icons appear twice... but I've sometimes found that with two Internet Explorer icons, (for example), one will work to start up the program while the other one does nothing if double-clicked! A list of possible drive letters, A-Z, even if most of these are not currently available on your computer. Unchecking a letter means that that drive letter no longer appears in My Computer, or in the File/Open and Save dialogue boxes of your applications. Oddly, the unchecked drives still seem to appear in Explorer-- turning off drive C:, for example, means that users won’t be able to easily (and perhaps accidentally), save to their local hard drives--but can still save to designated network drives, or floppy drives. I’ve done this on my student machines, where I don’t want students saving to the hard drive. (Even though the icon is hidden, you can make an Explorer window to a hidden drive appear by typing the drive letter in the Start Menu's RUN dialogue). Note that if you uncheck any drives, you can no longer edit the Start Menu by right-clicking on the Start Button and choosing Open or Explorer from the popup menu--those items are greyed out. As far as I can tell, this is a bug, not a feature but continues through version 1.33. You can still edit the Start Menu by right-clicking on the Taskbar, and choosing Properties from the popup menu. This lists the various *.CPL control panel files, and lets you unselect ones you’re unlikely to use--they will no longer show up in the Control Panel. For instance, you may not need to see the Game Controllers control panel icon on a notebook with no game port. Or the Regional Settings control panel. Or the ODBC Data Access control panel installed by Microsoft Office, if you’re not accessing these sorts of large corporate databases. Or the Telephony control panel. Turn them off and remove some clutter-- you can always easily get them back it you need to! A single option--to automatically logon. It notes, however, that any password you list here is not encrypted, and can be viewed in the System Registry, using Regedit. Still, this is especially useful on a single-user computer running NT or Windows 2000, which insist on a user logon (unlike Win 95/98)-- as it can logon automatically for you at each bootup. It can also be useful on a Win9x system if it connects to an NT/W2000/XP network to share files or printers. When you right click on the Desktop or elsewhere, you may notice NEW as an option in the popup menu-- clicking on it gives the useful New Folder option, as well as a bunch of new, blank documents for various programs. Does anyone actually create new documents this way? By default, you may even have the option to create blank documents for programs that you don’t even own. This item lets you remove items from the list. You may want to leave the New Briefcase item in the list--that way, you can delete the Briefcase from the Desktop, and still have a way to get it back in the unlikely eventuality that you want to try it out someday. 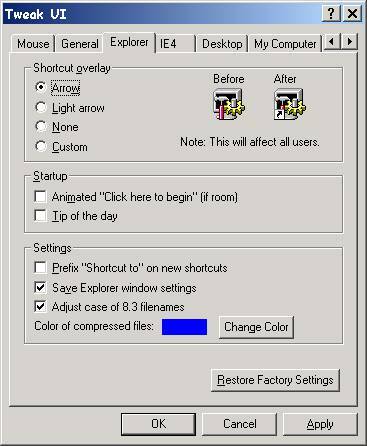 If you have a Windows 3.1 program that included an Uninstall icon, but doesn’t automatically add itself to the Control Panel list (MS Works 3.0, for example), you can click on the New button, to add it to the Control Panel list--first, find the properties of the Uninstall icon, and copy down the command line--then you can enter the exact same thing in the Command field here--so that choosing it from the Control Panel will run the correct program. note: If you've installed the current 1.33 version on a Windows 2000 system, this tab does not appear- though it does appear with that version of TweakUI installed onto a Win98 system. Curious! However, if you try to remove an application in Win 2000's Add-Remove control panel, and the uninstall doesn't work, Win2000 offers to remove the application from the Add-Remove list, so this TweakUI item is less needed in this case. This lets you turn on or off a variety of settings at system startup--whether the F8 function key, for example, can be used to call up the boor menu, whether Win9x starts up automatically, whether the Microsoft cloud screen appears at startup, and whether you can boot to your former operating system (only on machines that were upgraded from DOS/Win 3.1). You can also set it to always show the boot menu, for a set number of seconds--useful in some trouble-shooting situations. Very useful! Ever had desktop or System Tray icons get munched somehow, and show the wrong icon? Pick the Rebuild Icons item here, and click the Repair Now! Button, and you may be able to fix them. Also useful, from the dropdown list is to repair the Font Folder, if you’re having trouble displaying or accessing fonts. The other items are less commonly needed. Aptly named! This lets you automatically cover your tracks by emptying the lists of Recent Documents, Run, Last User, and more whenever the system restarts. Nice to set on computers used by multiple users-- so Johnny doesn’t get to see what documents Mary was working on. As well, for no good reason, you can set audio and data CDs to play automatically--or not. (Note--for this to work, you need to have Auto-Insert Notification turned on-- If this isn’t working for you, go to the System control panel, and go to the Device Manager tab. Find your CD-ROM drive in the list of devices, select it, and click the Properties button. Go to the Settings tab and make sure [x] Auto-Insert Notification is checked. There are a number of tabs that I haven't covered-- hopefully the options are either obvious, trivial, or so complex that most users can safely ignore them! Feel free to check them out, however, and if you have any questions, email me. And that’s it-- a lot of items that you can happily ignore, but several that can make your life much easier (turning off easy access to Drive C: for example, in a networked classroom), and some that simply clear up some common annoyances, such as the undeletable desktop icons, or the stupid ‘Shortcut to--’ prefix on shortcuts.